There are a variety of wheelchair arm rests on the market to meet the needs of various types of wheelchair users. Armrests on wheelchairs have various functions depending on the user's needs but the most common are aids for transferring, comfort while sitting and weight shifting. Wheelchair users who are able to stand when transferring use the arms for support when sitting or standing and should be strong enough to support their weight. People who slide sideways off the wheelchair to transfer will use the armrest on the opposite side of their transfer to either push themselves off or pull themselves onto the wheelchair seat. The height of the wheelchair arms should be sufficient to rest the elbows on without forcing the shoulders to either hunch up or sag down for the best comfort for most users. Weight shifting is done when the user pushes themselves up off the seat of the wheelchair to change their position slightly. Everyone, with a disability or not, will weight shift somehow when sitting for a period of time. This action stimulates blood flow in the buttocks and reduces the chances of developing pressure sores. While most people want arms on their wheelchairs they are not required and do in fact actually add to the base price of most models of wheelchairs. If the user decides they do not wish to have arms the purchaser can save anywhere from $50.00 to $250.00 on the cost of the wheelchair. Fixed height arms are not as common or as useful as adjustable height arms as the user's elbows, which the wheelchair arms are supposed to support for comfort, are not all the same height. Arm lengths are, of course, longer on some people than others and even if they are the same length they may be different heights depending on the thickness of the cushion they use. Adjustable height arms are much more common for wheelchair users because they can be adjusted for different user arm lengths and cushion thicknesses. In addition to these benefits the adjustable height armrests can be quickly changed in height to extend under or over the top of a table or desk which eliminates the benefits offered by desk length arms. Full length arms are the most common and generally extend the full distance from the back canes of the seat frame to the front of the seat frame. Full length arms give the user a larger area for gripping to support themselves during transfers and more support for arm mounted wheelchair trays. Full length arms are available in both fixed height and adjustable height. Desk length arms are generally long enough to support the users elbows when seated and are about 4" shorter in length than full length arms. The advantage of desk length arms is the user can get closer to a desk or table because the arms don't bump into the desk as soon as full length arms would. Desk length arms are available in both fixed height and adjustable height. Fixed arm rests on wheelchairs are welded or otherwise permanently attached to the frame of the wheelchair. Most wheelchairs today do not offer fixed arms with the exception of chairs designed for institutional use. Removable arms are arm rests that can be removed from the wheelchair. This feature is important for many people who transfer onto and off of the wheelchair by sliding sideways off the seat. 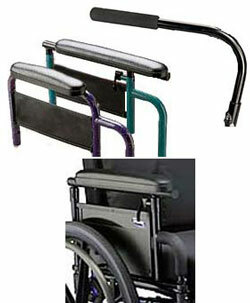 Removable wheelchair arms are available as both fixed and adjustable height as well as desk length and full length. Flip back arms are hinged at the rear connecting point to the seat frame of the wheelchair and when a latch is released at the front attachment point will flip to the rear of the wheelchair and out of the way for sliding transfers or to get up close to a table or desk. The huge advantage of flip back arms is they remain attached to the wheelchair and within reach of the wheelchair user at all times. Cane arms are very basic arms for users who don't really need the arm for transferring or supporting a tray. These arms are simply to be elbow rests when sitting and can be used for weight shifting if the user outs the pressure towards the back of the armrest where it is stronger. The length of these arms will vary between wheelchair models. Cane arms will often swing away to the side of the wheelchair and may flip back or be completely removable for sliding transfers. They can be adjusted for height but not quickly and may require tools to do so. Once the height is set, it is usually left there and not changed unless the wheelchair cushion is changed and a different height is needed.